It’s a country of over a billion people, thousands of years of invention and innovation, and just about everything you buy is made there or features something that was. 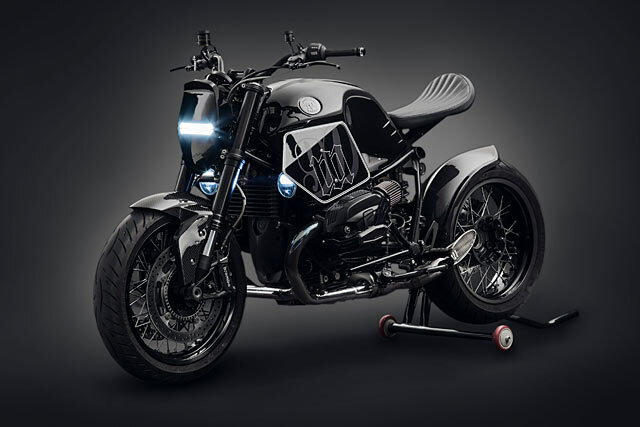 Yet around the world there is those who still doubt the quality of product that comes from China, but in recent years the major motorcycle manufacturers have shown it’s not a fear they share. 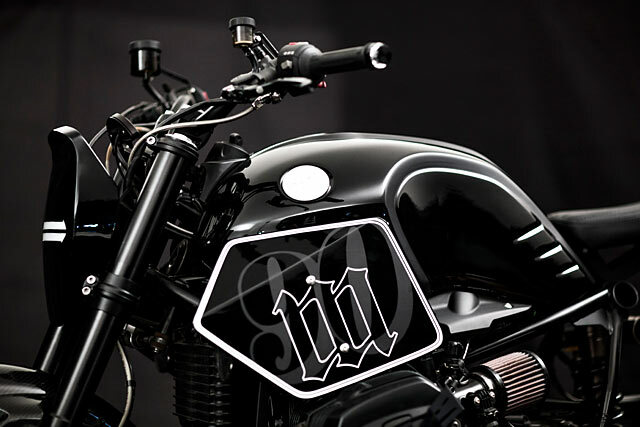 Now comes the wave of crazy customs and leading the charge is well established workshop Beijing’s Mandrill Garage. 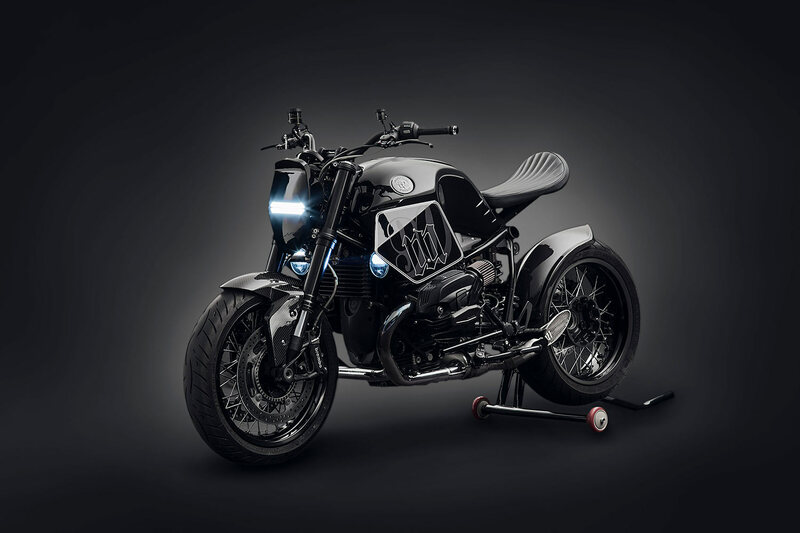 Team leader Luo Hao is hitting 2018 running with a 2017 BMW R NineT Neo-Racer that’s ready to rip up the late night Chinese streets, appropriately called Dark Fighter. 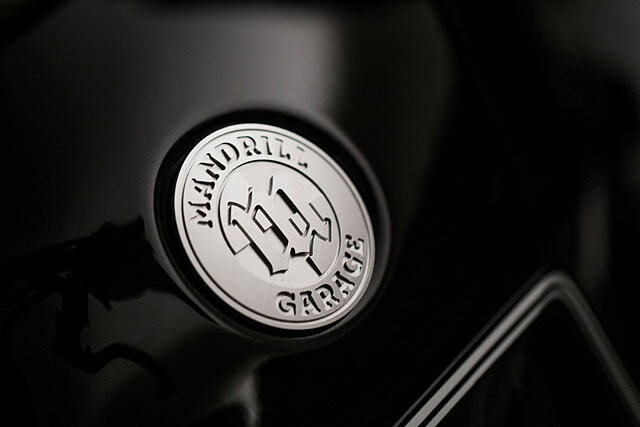 Although most readers may not be familiar with Mandrill Garage they’ve been around for the past six years, building some amazing bikes and in the adjoining Mandrill Cafe they have a place to enjoy a drink, throw a party for friends and talk all things motorcycles! Lou Hao is a graphic designer by trade and along with three other friends created the brand to combine their talents and their love of the custom culture. 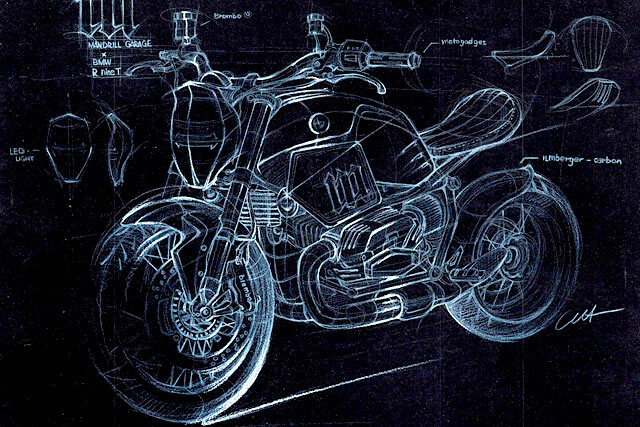 Having built a fleet of classically styled machines, including a stunning R90 BMW, Lao explains they wanted to do something very different this time around, “The idea was to create something anti-retro, to remove the headlight and instead use a mask like medieval armour, I wanted to build it like street fighter.” With the bike rolled into the workshop the strip down process could begin, this a zero km machine that the client had brought straight from the dealership to Mandrill Garage. 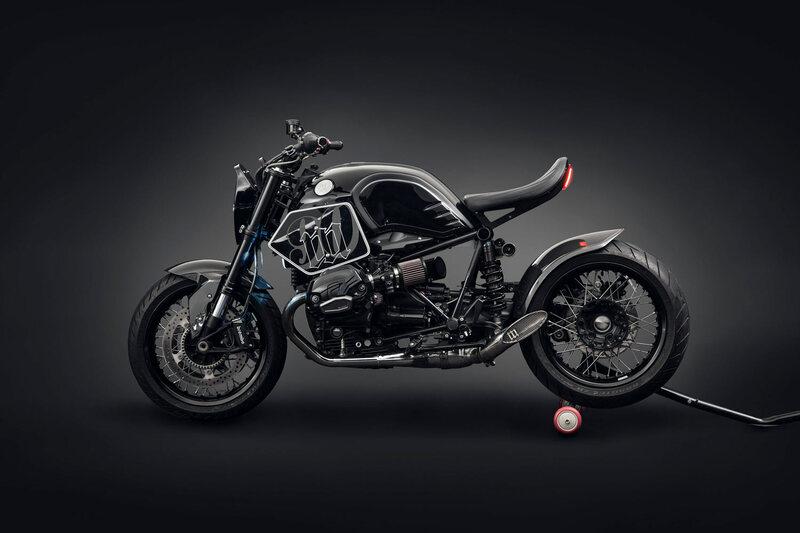 It was this time spent staring at the NineT that Lou decided, “The part I don’t like most on the BMW is the seat.” So with that not only was the seat removed but the entire rear subframe. 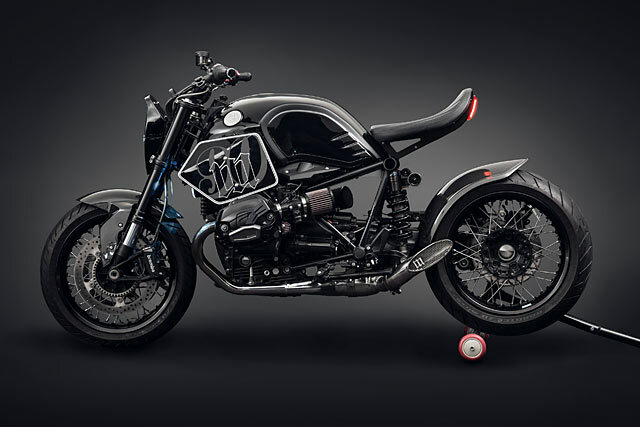 In its place is a much smaller piece that was designed and made in-house, CNC machined and only just big enough to support the seat he’d designed, drastically reducing the visual length of the bike. 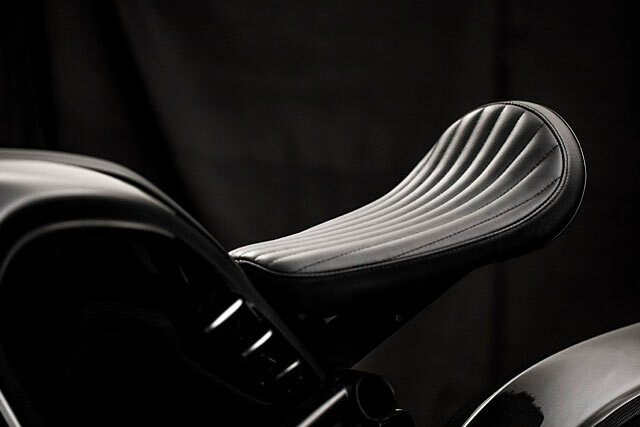 The seat itself is a beautiful black leather tuck n roll number, with a large kick up to keep the rider in place. 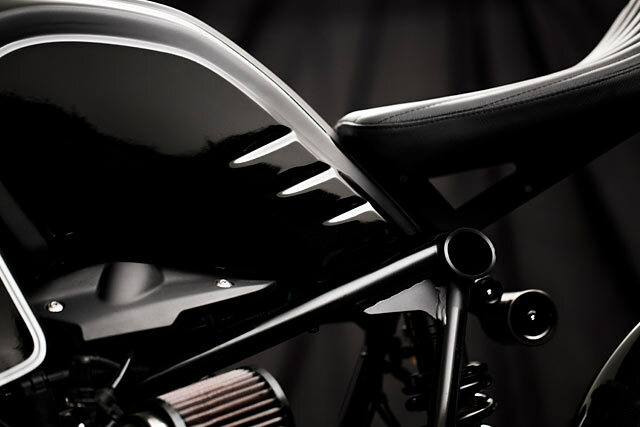 With the aluminium subframe powder coated black and sitting lower than stock, the tank was now showing off some unsightly pieces where the stock seat rests. So the tank came off and was subjected to more than a few subtle changes. The rear has been completely smoothed out, the sides prepared for changes to come and the stock BMW badges ditched in favour of machined shop items that sit further recessed into the metal work. Affixed to the sides of the tank are a pair of number boards with the Mandrel M and the number 90 painted on in white and grey respectively. But everything else has been treated to a brilliant coat of gloss black, even the front forks were sent out for anodising, the stock gold deemed unfit for this Dark Fighter. 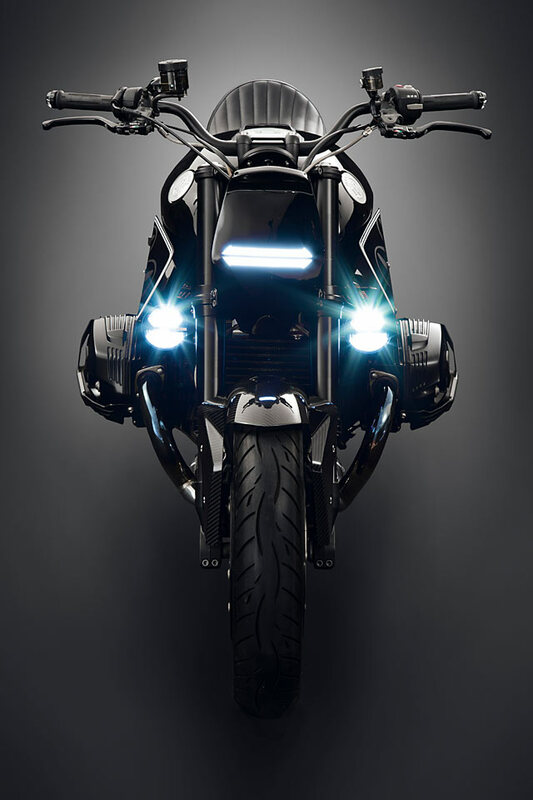 Giving the BMW its personality is that front mask, designed by Lao to give a medieval look, an LED light acts as a single eye. But the real headlights are actually mounted off to the side, tucked in behind the number boards. Saving weight and fitting perfectly into the Neo theme are the front and rear fenders, made from high quality carbon fibre. 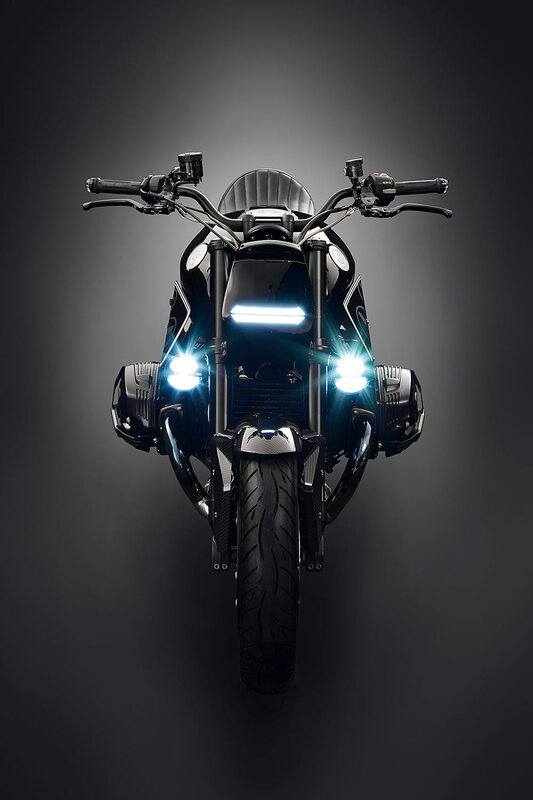 The front a relatively stock looking piece while the rear has a ribbed arch and pointed finish for a long sword like visual to menace those riding too close behind. The airbox has been removed to further reduce weight and a little more horsepower extracted at the top end thanks to the K&N pod filters. 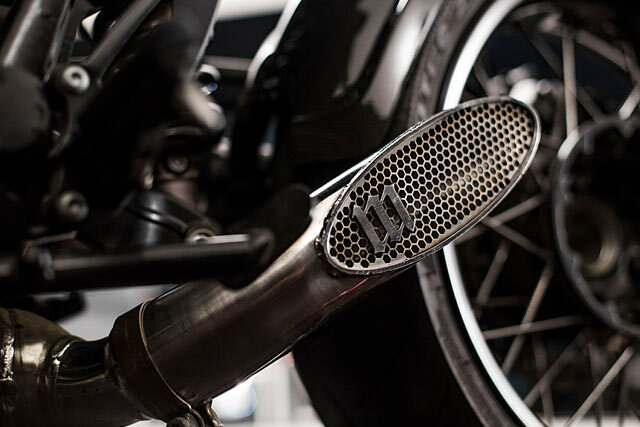 But it’s the handmade stainless steel exhaust system with GP style slash cut muffler, meshed off and logo’d, that adds the real ponies. The factory forks and Brembo brakes were deemed fit for the project but the team wasn’t happy with the performance of the stock rear shock. So out it came and in goes a fully adjustable item from Gears Racing that has allowed the bike to be properly dialled in for the customers dimensions. To give the rider even more control Brembo RCS radial master cylinders for both brake and clutch replace the factory fitted items and allow for fine tuning on the fly. 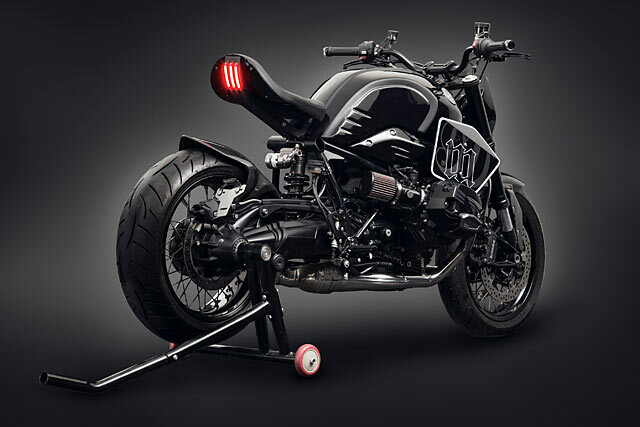 To keep local law enforcement happy a custom taillight was made for the Beemer from three red LED strips, while bar end turn signals finish out the job. All said and done team and client couldn’t be happier, while for Lao the stand out piece is the front headlight assembly. 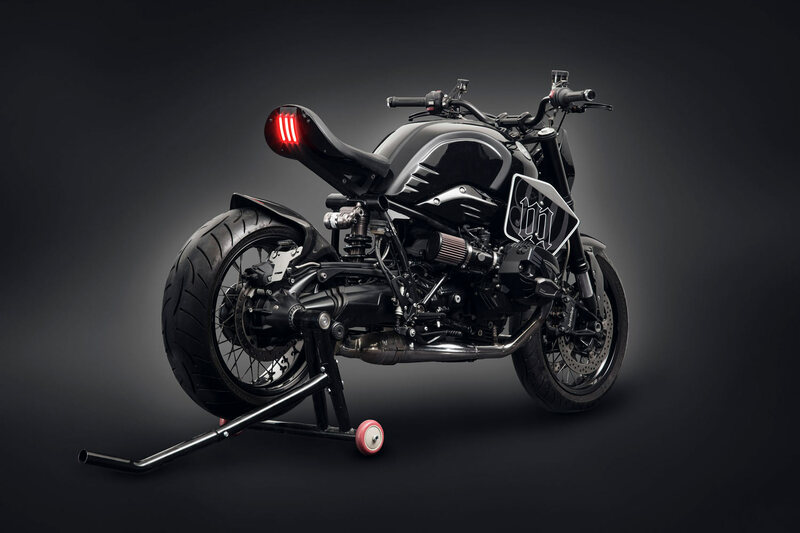 “When you look at the bike from the front, it looks like a Robot or Ironman – maybe even a medieval knight.” Whatever it is that you see it’s clear that this Neo-Racer from Mandrill Garage is a sign of big things to come from the world’s most populous nation. Dark Fighter is leading the charge but you best believe it won’t be the last with a horde of mechanical masterpieces joining the Terracotta Army as a new century of Chinese warriors emerges.